Health Education services are provided to the community on public health preparedness topics including emergency preparedness (sheltering in place and emergency evacuation), bioterrorism, communicable diseases, and disease prevention. Health education is provided through presentations to worksites, community groups and agencies, and at community health fairs. A bilingual (English & Spanish) health education display at the Rt. 12 Hunterdon County library highlights a different public health topic each month. Preparedness staff also develop just in time training for use during division preparedness drills and exercises. Public Health Preparedness is providing residents with Important Contacts magnet to help promote health-related resources. This important contacts magnet is one way Hunterdon County is connecting its residents to local services which play key roles in health, behavioral health, and social services. These contacts are helpful during an emergency and after, in the recovery process. Magnets are available for residents to pick up at the Hunterdon County Health Department’s main office. Click here for office hours and directions. Anyone can be affected by unintentional poisoning. 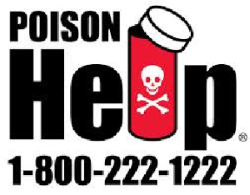 Most poisoning occurs in the home and at any time of the day or night. 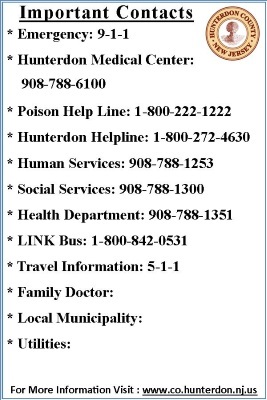 The NJ Poison Control Center assists callers of all ages (infants, children, teens, young adults, adults and older adults) and those who speak languages other than English. 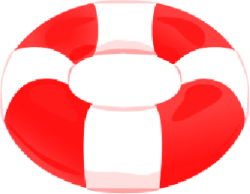 Get help right away 24 hours a day, 7 days a week. 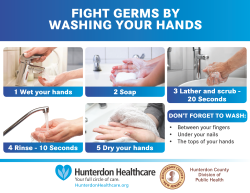 FIGHT GERMS BY WASHING YOUR HANDS.